ENDLESS NIGHT Vampire Ball - NY : Halloween Edition! 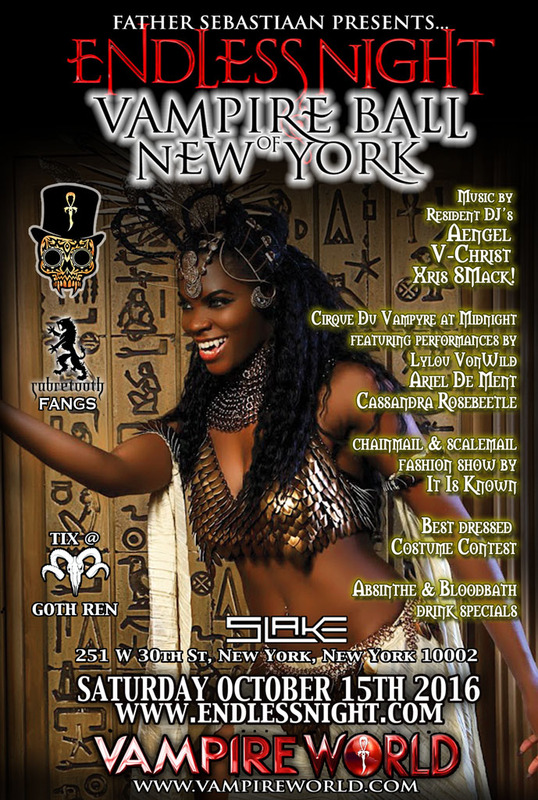 SLAKE welcomes the world famous ENDLESS NIGHT with impresario Father Sebastiaan to host the New York Vampire Ball “Halloween Edition” 2016. CELEBRATING a gathering of the spirit, mystery, magick, romance, sensuality and immortality of the Vampire World and culture. BALLROOM DANCING from 11pm-Midnight in the upper floors with NantucketBallroom.com. CIRQUE @ MIDNIGHT - we are now presenting all of our main performances back to back in a pack so you know when to arrive and see the energy centered in the evening. FANGS by Father Sebastiaan can be booked before the event online at www.fathersebastiaan.com/fangs. Book quickly as there are limited slots. DOOR POLICY: 21+ with government issue photo ID (no exceptions) and in proper dress code (no jeans, sneakers, etc.) with medieval, steampunk, gothic, fetish or vampire attire. Masks and fangs are highly encouraged.